A recent article on the Political Calculations blog entitled “Demographically Driven Inflation and Deflation” described a relationship between demographics and the “…’flation” twins, IN-flation and DE-flation. By coincidence the night before the article was published I had asked myself a question: “where will the demand come from?” That is, how might my baby boom generation (e.g., “demographics”) impact the economy? The paragraph below and accompanying chart are from the article. Note: the Political Calculations article described a relationship between inflation, deflation and demographics. The authors found that changes in the labor work force predicted the resulting ‘flation after a two year time lag. I recommend the blog and the article. This consumption pattern is sustained throughout an individual’s working life, until they retire. Shortly after retirement, personal consumption expenses tend to drop sharply, as work done by Mark Aguiar and Erik Hurst demonstrate in their 2008 paper Deconstructing Lifecycle Expenditure. We’ve [“Political Calculations”] excerpted a chart from this paper (left) to show how attaining retirement age would appear to affect personal consumption. The gist of the Political Calculations article (assuming that I understood it properly) is that demographics can be used to predict and may be the dominant factor in, the resulting ‘flation after factoring in a two year time lag. The Aguiar/Hurst chart suggests (again, assuming my understanding) that non-durable expenditures may drop by 15% to 20% from a peak around age 55 to typical retirement at 65 and declines steadily thereafter. If you include housing services in the data the chart suggests a 10% decline (from .37 down to about .27) in total expenditures from age 55 to 65 and relatively stable spending after that. As we age we spend less and less on “nondurables” but somewhat more on housing services (cleaning, maintenance and so forth). (c) how will the worldwide production capacity be utilized without the demand created by the excess baby boomers as they reduce their expenditures? Allow me to step back and personalize this a bit. At 62 I am in the second year of the baby boom generation. We are the pig-in-the-python generation that has disrupted the nation (the world?) and distorted economic data for some 60 years now. My earliest economic recollections are of a massive demand for school construction alleviated somewhat by dual session classes (K-12). My wife recalls triple session classes. Then we (some of us) filled colleges to overflowing and again there was the demand for new construction. Many of us (me included) went off to war, an unpopular war to be sure but bullets are bullets. From college/military/tech school/high school we all set off to find jobs, spouses, houses, cars and at various times we produced babies who needed all kinds of baby things. As we grew older our basic needs were more or less fulfilled and our wants took dominance in the economy. From starter homes we went to “McMansions”. From weekly vacation rentals we went to second homes on the beach or in the mountains. From one car we went to two, then three, four or more depending on the kids and the deals. From one TV we went to multiple, color TV’s and now to multiple plasma/LCD TV’s. From slide rules we went to calculators then personal computers followed by laptops, and now netbooks. And we didn’t have just one per person but often two or more. From landline dial up phones and pay phones on the corner we went to cell phones, smart phones and all kinds of fruit phones. But it wasn’t a growing population doing all this. It was the same demographic bulge (plus a mini-bulge from our children) basically driving the demand. But at every point in this demographic cycle business and government ignored the down slope of the backside of the bulge. That’s the point where aggregate demand trails off. That’s what the Aguiar/Hurst chart depicts. Early on when confronted with the up slope of the front side of the baby boom bulge, businesses and factories worldwide were built and expanded, workers were hired to run the factories and economies grew. Of course, expectations for growth were likewise expanded. The Wall Street Journal just recently had an article about the drop in sales for Toyota that demonstrates this very fact. Toyota over expanded automobile manufacturing factories and now has too much capacity for the demand. See the article, “Toyota Posts Big Loss, Signals More to Come“. Toyota is not alone. Chinese factories, Australian and South American mines, United States houses, all were built and expanded to meet that expected growth. That up slope would go on forever, wouldn’t it? And it all seemed to go well for the most part. Yeah, we had a few hiccups with the oil embargoes and stagflation of the 1970’s. The inflation/recession of the 1980’s and the recession and financial meltdowns of the 1990’s (LTCM anyone?) were a bit troublesome. Then of course we had the 9-11 terrorist attacks, the tech stock bubble bursting and recession, the follow on housing bubble and subsequent bust, recession/depression of the aughts (the 2000’s). And now along with my cohorts I’m getting kinda old. My needs were long since fulfilled, my wants I can’t afford so well anymore and some of them I’ve just flat outgrown. Not buying any big boy toys anytime soon. Have to watch my retirement finances of course. And, like many of my compatriots, those resources are a bit tarnished of late. So I’m no longer in the market for a second home or a third car. My wife and I already have two cars, two computers, two cell phones and four TV’s. I’m basically in replacement mode for anything I might want – need. I know too that my personal spending has been declining for the past few years. And, I know that if I’m reducing my spending then so are others of my generation. See, that’s been a pattern I’ve observed over the past 40 years or so. In a general manner, as a self-taught (and therefore untrained) street level economist, I’ve observed that as my wife and I make our seemingly independent economic choices very often those choices show up in the national economic statistics several months later. Again the Aguiar/Hurst chart depicts my families’ personal, independent, economic activity. So, if we’re cutting our spending where will the demand come from to utilize the now idle worldwide factory capacity? Recall that I had referenced “… excess baby boomers …” in my earlier question. Note also that the article mentioned at the start of this post considers the birth rate. By contrast, being an untrained, street level economist I choose to focus on total population not birth rate. And of the total population most especially that portion of the baby boomer population that exceeded long term expectations. They are the marginal group that has blown up economic statistics for over 60 years. From 1929 through 2008, excluding the years 1947-1966, population growth averaged 1% annually. However, during the baby boomer period (1947-1966 *) population growth averaged 1.7% annually. 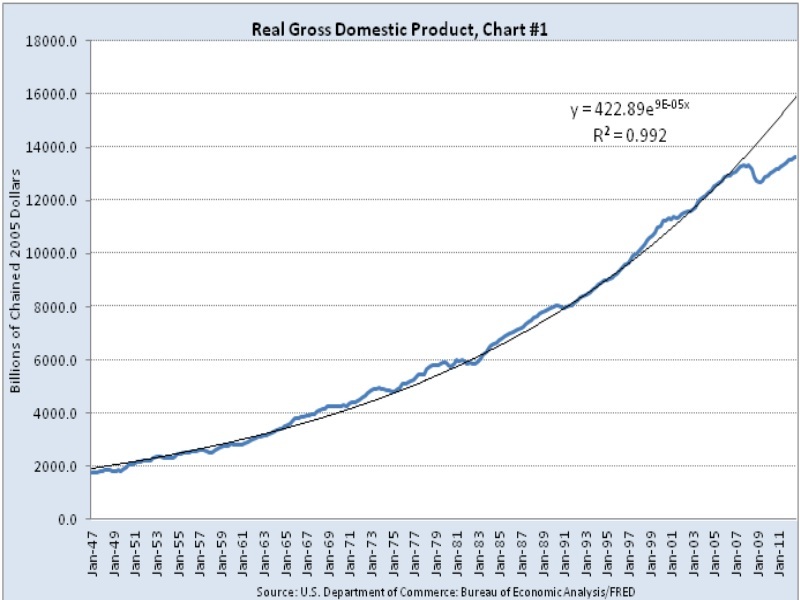 That excess 0.7% growth above the long term trend amounts to an excess of over 24 million individuals as of 1966. That is, actual population as of 1966 was about 196.6 million. If, starting in 1947 actual population had only grown at the long term average rate of 1% then the 1966 population would have only been about 172.5 million. The difference, over 24 million is what I term the excess baby boomer population. This excess population resulted from a period of population growth well above the long term average. This excess, now approaching retirement will not be quickly replaced, if ever. The minor population boomlet from 1989 through 1992 has quickly dissipated. In fact, population growth rates have been trending downward since 1992 as seen in the chart below. In 2002 those of us born in 1946/1947 hit that magic age of 55 at which time the Aguiar/Hurst chart notes our personal consumption expenditures begin to decline. 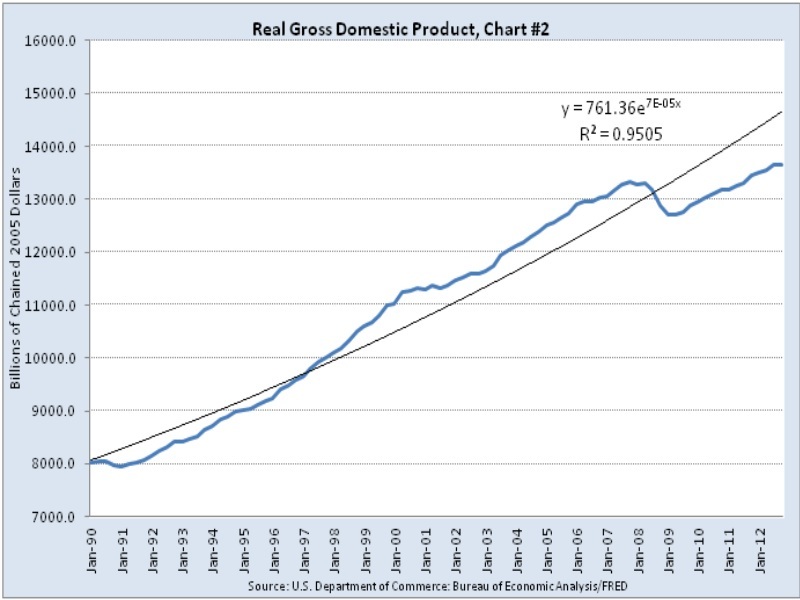 Unlike other years though, what began in 2002 is a gradual reduction in aggregate demand that will be greater than would otherwise be expected had demographics been more consistent. For example, in 1947 total population was 144.1 million. Had the growth rate only been 1% (instead of the 1.9% actual) the total population would have been 142.8 million. The difference, in this one year, was 1.3 million people more than the long term average would have predicted. Starting in 2002, when these people reached 55 there will be 1.3 million more people than the expected average that will decrease their spending. And, ultimately around 2022 these additional people will begin to die thus ending their spending completely. Worse, there isn’t enough new population, percentage wise, to make up for their passing. Since the long term rate of growth in population has returned to the 1% trend (except for a minor spurt in the 1990’s) and since the actual population that is reaching retirement is greater than expected (compared to long term trends) it follows that aggregate demand may fall greater than expected. Simply put, there are insufficient numbers of new population to both replace the natural decline in demand and also provide the desired aggregate growth in demand. Simply put, our economic system is predicated on a rising population but it is not enough to simply grow population in absolute terms. The percentage rate of growth must be high enough to provide the GDP growth rate desired to improve the overall standard of living. In that sense our economic system is essentially a “Fertility Based Ponzi Scheme”. A recent post on The Daily Reckoning Australia , “They Say the Stock Market ‘Looks Ahead’” included a brief overview of the current state of the U.S. economy. What intrigued me is that all of these elements, generalized though they may be, are descriptive of the baby boomer generation. In the 80’s baby boomers were hitting their big spending strides which continued into the 90’s. But by 2002 those of us at the leading edge slowed down as we hit age 55. We stopped spending so much. Stared at the retirement abyss and freaked. The Aguiar/Hurst chart became our reality. The table below shows the excess baby boomer population for each year. The cumulative total of excess baby boomers is some 24 million. Add to that count the trend level boomer population of another 50 million or so and there is a massive demographic bomb slowly exploding. As of 2002 individuals born in 1947 have reached age 55 and have begun to slow their spending. The excess population in that year’s age group is 1.323 million. In 2003 another set would reach age 55 and the excess population in that year’s age group is 1.077 million. Cumulatively it is 2.4 million aging baby boomers in excess of long term trend population. Obviously this continues every year and now, as of 2008 there are almost 8 million boomers aged 55 or over in this excess population group. As of 2008 per capita “Personal Consumption Expenditures” (PCE) averaged $33,035. If my group of boomers (I am one of them now) reduce their PCE by 10% it will be at least $3300 per person. Probably a lot more since this age group is at both peak spending and earnings levels. Next year, 2009, will be more of course. Now I grant that in a $14 Trillion economy $26.4 Billion is a rounding error. Unless of course, it is your job, business or retirement that depended on that bit of extra spending. Then it is a calamity. Just ask Toyota, or GM or Chrysler. By 2021 when the last of the boomers hits 55 the total lost PCE will begin to approach triple this amount – over $79 Billion at 2008 rates. Again, not a huge hit in a $14 Trillion economy but for those operating at the margins of this economy it may be a serious blow. But keep in mind that this reduction in spending is only from the excess baby boomer population. The remaining 50 million “average population” of aging boomers (about double the number of “excess” boomers) will also be reducing their spending. And it is the younger generations that must recoup that entire reduction in demand and then some if they are to achieve net economic growth. That is, the 25-45 age group will need to recoup some $240 Billion of spending (all boomers reducing spending by at least 10%) just to remain even. But I don’t see any obvious mechanism for this loss of excess demand to be recouped. The remaining population will do well just to maintain some economic growth. There simply isn’t enough population growth to create an increasing economic growth rate and overcome the Personal Consumption Expenditure loss from the excess baby boomer population. And, even worse, since the government and business community has ignored this demographic bomb production capacity has been expanded to meet what was falsely assumed to be a rising demand curve. Now we have both falling demand and over built capacity. The chart above is a dramatic illustration of the demographic tsunami that is just now hitting the US (and the world) economy. Over the next 20 years the aging of America will have a similar, albeit reversed, impact on the economy as it has for the past 60 years. But now the baby boomers will start to extract growth instead of provide growth. But few of those in a political position to comprehend this issue seem to be concerned. Today their singular concern is to force feed credit in what I believe will be a futile effort to revive a PCE demand that simply will not return. It cannot return. Our “Fertility Based Ponzi Scheme” has run out of new investors, so to speak. The US economy has pulled a “Bernie Madoff” and both are in deep trouble.